Jere (Samuli Vauramo) is a single father and gym entrepreneur living on social security, Francis (David Nzinga) is a paperless man on the run, and Vera (Laura Birn) is an actress stalked by her child’s deadbeat dad. These well-meaning but helpless people are brought together by chance. By the beginning of the film there’s a dynamic scene where Jere and Francis meet in a cabin of a night train. From there on plot twists, lies and Vera’s theatrical scenes intertwine in a fabric of stories whose sinister atmosphere is reinforced by a fragmented timeline. 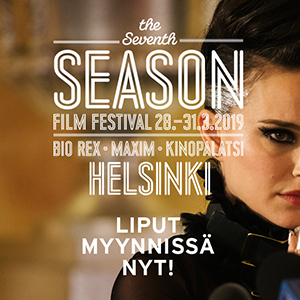 Social issues are present in director-writer Simo Halinen’s portrayal of people’s actions when having limited possibilities. The film’s structure, combined with the city of Oulu’s wintry landscapes, frames melancholy and hopeless situations well. Moments of joy happen when people come together; but happiness is bound to vanish once you’re getting hold of it. Grand emotions inflate the film: courage, despair, fear, guilt. Choices, however, become the main theme. Should one run from the law, one’s feelings, or the consequences of one’s actions? Or should one face their situation by taking a class in self-defense instead? Director Simo Halinen will be present at the screening on 27 September at Kinopalatsi 5 at 15.45.